March weather can be gorgeous but it can also be nasty with a healthy dose of any of the four seasons. Our look back at this week highlights this with a number of notable weather events from powerful, damaging winds to landspout tornadoes and of course monstrous snow storms. In 1906…an extended cold and blustery period occurred with light snow totaling 14.4 inches over 11 consecutive days. The greatest amount of snow on a single day was 4.0 inches on the 15th. Only a trace of snow fell on the 12th and 17th. High temperatures were below freezing for the entire period. The coldest were 14 degrees on the 16th and 18 degrees on the 17th. Both readings were record low maximums for the dates. Low temperatures were mostly in the single digits. The coldest were 2 degrees below zero on the 16th and 5 degrees below zero on the 19th. Northeast winds were sustained to 22 mph on the 9th. North winds were sustained to 36 mph on the 10th…32 mph on the 13th…and 22 mph on the 15th. In 1989…strong winds raked metro Denver. West wind gusts to 49 mph were clocked at Stapleton International Airport. In 2003…the first tornado of the season was sighted near Strasburg. The small landspout touched down briefly…but caused no damage. In 1923…4.2 inches of snow fell over downtown Denver. Northwest winds were sustained to 45 mph with gusts to 49 on the 17th. Low temperature of zero degrees on the 18th was the lowest of the month that year. In 1944…heavy snow fell across metro Denver. The storm started as rain on the 17th…but soon turned to snow. Snowfall amounts totaled 8.5 inches in downtown Denver and 11.0 inches at Stapleton Airport. The highest wind recorded during the storm was 23 mph on the 17th. In 1961…a major winter storm dumped 10.7 inches of snow at Stapleton Airport. Most of the snow…9.7 inches…fell on the 18th. Winds were light. In 1994…strong winds buffeted metro Denver. West winds gusted to 51 mph at Stapleton International Airport on the 17th. Other significant wind gusts included 85 mph atop Squaw Mountain south of Idaho Springs…and 82 mph at Rollinsville southwest of Boulder…both on the 18th. In 1996…a second storm in less than 3 days dumped heavy snow in the mountains and foothills again…but snowfall amounts across metro Denver ranged from only 2 to 4 inches. The heavy snowfall resulted in several traffic accidents along I-25 and I-70…south and west of Denver respectively. The major accidents involved at least 30 cars and resulted in several minor injuries. The accidents closed both highways for a time. Snowfall totals included 13 inches at Evergreen and 10 inches at Conifer. Snowfall totaled only 0.7 inch at the site of the former Stapleton International Airport. At Denver International Airport… North winds gusted to 28 mph on the 17th and 39 mph on the 18th. In 2016…a combination of enhanced banding associated with a strong upper level jet stream…and low level upslope following the passage of a cold front…produced heavy snowfall in northern mountains as well as in and near the foothills of Boulder County. Storm totals included: 19.5 inches near Ward…16 inches near Allenspark…13.5 inches near Eldorado Springs; 13 inches at the National Weather Service Office in Boulder and 5 miles east of Boulder; 12.5 inches at Winter Park Ski Resort…12 inches at Eldora Ski Area; 11 inches…7 miles south of Lyons and at Rollinsville; 10.5 inches at Aspen Springs… and 9.5 inches near Blackhawk. In Denver and the surrounding suburbs…storm totals included: 8.5 inches in Broomfield…Lafayette and 5 miles northeast of Westminster; 7 inches near Northglenn…6.5 inches in Thornton and northwest Denver; with 6 inches at Firestone. At Denver International Airport…an official measurement of 4.7 inches of snow was observed. In 1933…rain changed to snow on the evening of the 17th and continued through mid-day of the 19th. Snowfall totaled 5.6 inches with 0.83 inch of precipitation in in the city. North winds were sustained to 38 mph with gusts to 46 mph on the 18th and to 30 mph with gusts to 43 mph on the 19th. In 2003…one of the worst blizzards since historic records began in 1872 struck metro Denver with a vengeance. Heavy wet snow accumulating to around 3 feet in the city and to more than 7 feet in the foothills brought transportation to a near standstill. North winds sustained to 30 mph with gusts as high as 41 mph produced drifts to 6 feet in the city. The estimated cost of property damage alone…not including large commercial buildings…was 93 million dollars… Making it the costliest snowstorm ever. Mayor Wellington Webb of Denver said…”this is the storm of the century…a backbreaker…a record breaker…a roof breaker.” Two people died in Aurora from heart attacks after shoveling the heavy wet snow. The National Guard sent 40 soldiers and 20 heavy duty vehicles to rescue stranded travelers along I-70 east of Gun Club Road. The heavy wet snow caused roofs of homes and businesses to collapse. The snow also downed trees… Branches…and power lines. Two people were injured when the roofs of their homes collapsed. In Denver alone…at least 258 structures were damaged. In Arvada…a roof collapse at west gate stables killed a horse. Up to 135 thousand people lost power during the storm…and it took several days for power to be restored in some areas. Denver International Airport was closed…stranding about 4000 travelers. The weight of the heavy snow caused a 40-foot gash in a portion of the tent roof…forcing the evacuation of that section of the main terminal building. Avalanches in the mountains and foothills closed many roads…including I-70…stranding hundreds of skiers and travelers. Along I-70…an avalanche released by the Colorado department of transportation…blocked the interstate in both directions for several hours. Several residences between Bakerville and Silver Plume were evacuated because of the high avalanche danger. At Eldora Ski Area…270 skiers were stranded when an avalanche closed the main access road. After the storm ended…a military helicopter had to ferry food to the resort until the road could be cleared. The heavy snow trapped thousands of residents in their foothills homes in Jefferson County for several days. Two homes burned to the ground when fire crews could not reach the residences. Some schools remained closed well into the following week. The storm officially dumped 31.8 inches of snow at the site of the former Stapleton International Airport…the most snowfall from a single storm since the all-time record snowfall of 37.5 inches on December 4-5…1913. The storm made March 2003 the snowiest March on record…the 4th snowiest month on record… And the 5th wettest March on record. The 22.9 inches of snow on the 18th into the 19th was the greatest 24 hour snowfall ever recorded in the city during the month of March. The storm was also a drought-buster…breaking 19 consecutive months of below normal precipitation in the city. Snowfall across metro Denver ranged from 2 feet to more than 3 feet. The highest amounts included: 40 inches in Aurora…38 inches in centennial and 6 miles east of Parker…37 inches at Buckley AFB…35 inches in southwest Denver…34 inches in Louisville… 32 inches in Arvada…31 inches in Broomfield and Westminster… And 22.5 inches in Boulder. In the foothills…snowfall ranged from 3 feet to more than 7 feet. Some of the most impressive storm totals included: 87.5 inches atop Fritz Peak and in Rollinsville…83 inches at cabin creek…74 inches near Bergen Park…73 inches northwest of Evergreen…72 inches in Coal Creek Canyon…70 inches at Georgetown…63 inches near Jamestown…60 inches near Blackhawk…55 inches at Eldora Ski Area…54 inches 8 miles west of Sedalia…and 46.6 inches at Ken Caryl Ranch. The storm was the result of a very moist…intense slow moving pacific system which tracked across the four corners and into southeastern Colorado…which allowed deep easterly upslope flow to form along the Front Range. In 1883…0.3 inch of snow fell in downtown Denver. This was the only measurable snowfall of the month. In 1903…rain changed to sleet and then to snow…which became heavy. Post-frontal snowfall totaled 7.0 inches over the city. North winds were sustained to 51 mph with gusts as high as 60 mph. In 1905…northwest winds were sustained to 42 mph. In 1914…northeast winds were sustained to 46 mph with gusts to 56 mph behind a strong cold front. Snowfall was 3.4 inches over the city…but most of the snow melted as it fell. The estimated amount of melted snow was 8.1 inches. In 1920…a terrific windstorm occurred along the eastern foothills. Two deaths were attributed to the storm and some damage occurred. Both Denver and Boulder were affected by the strong winds. West winds were sustained to 51 mph with gusts as high as 66 mph in downtown Denver. The strong winds did considerable damage to property… Wires…plate glass windows…and indirectly loss by fire. The wind caused the death of one young girl by toppling the side of a brick building on her as she was standing on a corner waiting for a car. The wind was also responsible for several severe auto accidents due to blowing debris into the streets and blowing dust and dirt into the eyes of drivers. In 1954…west winds at sustained speeds of 40 mph and gusts as high as 56 mph produced some blowing dust at Stapleton Airport. 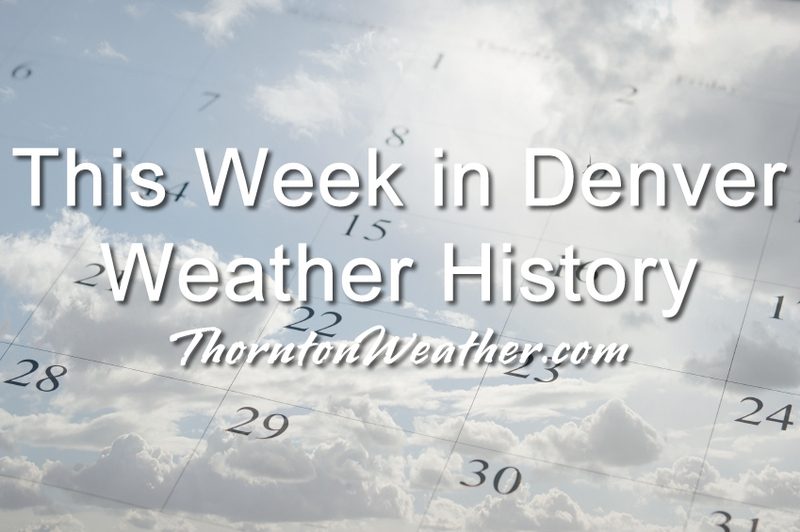 In 1979…heavy snow totaled 4 to 12 inches along the Front Range from Denver north. I-25 was closed for a brief time between Denver and Cheyenne. New snowfall totaled 4.3 inches at Stapleton International Airport where north winds gusted to 29 mph. In 1998…a major winter storm dumped heavy snow over areas west from I-25 to the continental divide as strong upslope conditions developed. Two to 3 1/2 feet of snow fell in the foothills with 1 to 2 feet reported in west metro Denver. Snowfall totals included: 38 inches at Silver Spruce Ranch…2 miles south of Ward; 35 inches at Aspen Springs; 33 inches near Blackhawk; 30 inches at Eldora; 29 inches in Coal Creek Canyon; 27 inches at Conifer… Chief Hosa…and Nederland; 25 inches at Rollinsville and Gross Reservoir; 21 inches at Evergreen; and 15 to 19 inches at Broomfield…Lakewood…and Table Mesa in Boulder. Elsewhere across metro Denver…snowfall ranged from 8 to 14 inches. Snowfall totaled only 7.9 inches at the site of the former Stapleton International Airport. East winds gusted to 31 mph at Denver International Airport. In 1927…heavy snowfall was 6.5 inches in downtown Denver. Northwest winds were sustained to 28 mph on the 18th. In 1974…heavy snowfall totaled 5.8 inches at Stapleton International Airport where northeast winds gusted to 33 mph on the 19th. In 1907…a warm spell resulted in 6 daily temperature records. Record maximum temperatures of 82 degrees occurred on the 18th with 81 degrees on the 19th and 80 degrees on the 20th. Record high minimum temperatures of 52 degrees occurred on the 19th and 20th with 54 degrees on the 21st. In 1969…high winds buffeted the Front Range foothills causing damage in Boulder and Jefferson counties. A freight train was derailed near the entrance to a canyon 20 miles west of Denver when some empty cars were caught on a curve by a gust of wind. Two light planes were heavily damaged at Jefferson County Airport. Winds gusted to 105 mph at the National Center for Atmospheric Research in Boulder…62 mph in downtown Boulder…and 80 to 90 mph at Boulder airport. Northwest winds gusted to 49 mph at Stapleton International Airport. In 1976…northwest winds gusted to 55 mph in Denver with stronger winds along the foothills. The strong cold winds kicked up some blowing dust…reducing the visibility to near zero at times at Stapleton International Airport. In 1982…high winds across metro Denver caused minor damage to a few mobile homes at Lowry Air Force Base. West wind gusts reached 51 mph at Stapleton International Airport where visibility was briefly reduced to 1/4 mile in blowing dust. In 1995…strong winds associated with a pacific cold front blew across metro Denver. A west wind gust to 48 mph was recorded at Denver International Airport. Winds gusted to 59 mph at the site of the former Stapleton International Airport. In 2010…a storm system produced deep upslope and brought heavy snow to areas in and near the Front Range. The foothills of Boulder and Jefferson counties were the hardest hit. Storm totals included: 26 inches at Coal Creek Canyon…25.5 inches…4 miles southeast of Conifer; 25 inches at Genesee…24.5 inches near Kittredge… 23.5 inches…6 miles east of Nederland…20.5 inches…3 miles west of Jamestown…5 miles southeast of aspen park and 5 miles southeast Idaho Springs; and 18 inches near Ralston Buttes. In and around Denver…storm totals included: 15 inches in Golden; 12.5 inches in Boulder…11.5 inches at lone tree; 10.5 inches near Castle Pines; 11 inches…6.5 miles southwest of Castle Rock; 10 inches near Englewood…Highlands Ranch and 3 miles southwest of Wheat Ridge; 9 inches…4 miles west of Arvada…Broomfield…Centennial…Elizabeth and Westminster; 8.5 inches…in southeast Denver and Littleton; 7.5 inches in Louisville and near Thornton; 7 inches…4 miles south of Aurora…Lakewood and Niwot; 6.5 inches…4 miles northwest of Castle Rock…4 miles northwest of Denver and Northglenn; 6 inches in Brighton and 5 miles southeast of Sedalia. Officially… 1.7 inches of snow was measured at Denver International Airport. In 1912…post-frontal heavy snowfall of 6.3 inches was measured in downtown Denver. North winds were sustained to 28 mph with gusts to 30 mph on the 19th. The strong cold front plunged temperatures from a high of 60 degrees on the 19th to a low of 1 degree on the 20th. In 1959…a major storm dumped heavy snowfall of 7.7 inches on Stapleton Airport where north winds gusting to 44 mph caused much blowing and drifting snow. Many highways were blocked…and there was damage to phone lines along the South Platte River. The storm started as rain and changed to heavy wet snow…which froze on the lines causing the poles to break. The storm caused 2 deaths over eastern Colorado. In 2006…strong northerly winds…associated with a surface low pressure system that intensified as it moved into the central Great Plains…brought heavy wet snow to the eastern foothills and northeastern plains of Colorado. The hardest hit areas included the foothills of Boulder and Gilpin counties. Storm totals included: 15 inches at Rollinsville… 14 inches at Aspen Springs…12.5 inches near Nederland…and 5.7 inches in the Denver Stapleton area. Strong winds…heavy snow…and poor visibility forced the closure of Interstate 70 from Denver east to the Kansas state line. North winds gusted to 32 mph at Denver International Airport on the 19th. In 1888…heavy snowfall totaled 8.6 inches over downtown Denver. North winds were sustained to 27 mph on the 19th. In 1915…north winds were sustained to 40 mph with gusts to 42 mph. Only a trace of snow fell. In 1989…2 to 6 inches of snow fell along the Front Range urban corridor with up to 9 inches in Boulder. Only 1.6 inches of snowfall were measured at Stapleton International Airport where north winds gusted to 36 mph. In 1878…warm days with high temperatures in the lower 70’s in the city…caused snow to melt on the Palmer Divide…which caused the waters in Cherry Creek to rise. The high…rapid running water damaged a home and eroded bridge footings and abutments. Some bridges became unsafe for the passage of trains. In 1904…southwest winds sustained to 48 mph with gusts to 60 mph warmed the temperature to a high of 68 degrees on the 20th. The high was only 42 degrees on the 21st behind a cold front…which produced 1.3 inches of snow and northeast winds sustained to 27 mph overnight. In 1923…post-frontal rain changed to heavy snow and totaled 8.2 inches over the city. North winds were sustained to 27 mph with gusts to 29 mph on the 20th. This was the second major snow in a week. In 1932…rain changed to heavy snow…which totaled 6.2 inches in downtown Denver. North winds gusted to 22 mph on the 21st. In 1948…heavy snowfall totaled 7.2 inches over downtown Denver. In 1952…a major snow storm produced north wind gusts to 35 mph and dumped 16.9 inches of snowfall on Stapleton Airport. The maximum snow depth on the ground was 13 inches due to melting. In 2000…heavy snow fell in and near the foothills of Douglas and Jefferson counties. Snowfall totals included: 9 inches near tiny town and 7 inches in Littleton. Snowfall totaled only 1.8 inches at the site of the former Stapleton International Airport. North winds gusted to 34 mph at Denver International Airport on the 20th. 20-22 in 1944…heavy snow fell over metro Denver for a total of 36 hours. The storm dumped 18.5 inches of snowfall over downtown Denver and 12.2 inches at Stapleton Airport. Fortunately…there were no strong winds with the storm. North winds to only 19 mph were recorded on the 21st. In 1898…an apparent Canadian cold front produced strong winds and plunged temperatures from a high of 56 degrees to a low of 8 degrees late in the day. North winds were sustained to 48 mph with gusts to 60 mph. In 1908…light snowfall of 1.3 inches produced 0.10 inch of precipitation. This…along with the 0.01 inch of precipitation on the 8th…resulted in the driest March on record with a total of 0.11 inch of precipitation. In 1916…southwest winds were sustained to 46 mph with a gust to 48 mph. The Chinook winds warmed the temperature to a high of 62 degrees. In 1923…heavy snowfall totaled 8.0 inches in downtown Denver. In 1953…northwest winds gusting to 57 mph briefly reduced visibility to 3/4 miles in blowing dust at Stapleton Airport. In 1981…rain changed rapidly to snow…but totaled only 2.8 inches at Stapleton International Airport. North winds gusting to 35 mph produced much blowing snow and reduced the visibility to a half mile at times. Over the higher elevations of south metro Denver…4 to 6 inches of snow were measured. In 1955…wind gusts to 98 mph were recorded at Rocky Flats south of Boulder. Some damage and a few minor injuries were reported in Boulder. Northwest winds were sustained to 28 mph with gusts to 39 mph at Stapleton Airport on the 22nd. In 1966…a vigorous cold front produced only 1.7 inches of snowfall at Stapleton International Airport…but northeast winds gusted to 49 mph on the 21st. Temperatures cooled from a maximum of 66 degrees on the 21st to a minimum of 14 degrees on the 22nd. Strong winds occurred on both days. In 1992…an arctic cold front produced upslope snow across metro Denver mainly west of I-25. Castle Rock reported 6 inches of snow with 3 inches at Evergreen. At Stapleton International Airport…only 1.5 inches of snowfall were measured and northeast winds gusted to 18 mph on the 21st. In 1905…apparent post-frontal north winds were sustained to 49 mph. In 1922…a vigorous cold front with north winds sustained to 41 mph brought only 0.6 inch of snowfall to the city. These were the highest winds of the month. In 1966…high winds caused extensive blowing snow that impeded traffic and closed highways over a wide area of eastern Colorado. Wind damage was widespread…but minor. North wind gusts to 47 mph were recorded at Stapleton International Airport where visibility was reduced as low as 1/8 mile in blowing snow. In 1975…a strong west wind gust to 51 mph was recorded at Stapleton International Airport…while east of Denver the strong winds caused minor property damage and considerable blowing dust which closed several roads. In 1979…near-blizzard conditions paralyzed the northeastern quarter of the state. Strong winds and drifting snow closed many roads…including I-25 and I-70. Power outages darkened sections of metro Denver. Snow accumulations of 4 to 12 inches were measured over the plains with drifts several feet deep. Only 3.5 inches of snow were recorded at Stapleton International Airport where northeast winds gusted to 39 mph causing some blowing snow. In 1995…strong winds associated with a fast moving pacific cold front moved from the mountains into metro Denver. Winds estimated at 60 to 75 mph picked up rocks and shattered the windows of a car in Louisville. The strong winds blew down and partially destroyed two houses under construction just north of Thornton. West winds gusted to 53 mph at Denver International Airport where the visibility was briefly reduced to 1/2 mile in blowing dust. In 2016…two brief but powerful gustnadoes developed along a convergence line that formed in the suburbs just north and west of Denver. Three power poles were knocked down. In addition…a small storage shed was destroyed. In 1936…heavy snowfall of 7.7 inches was measured in downtown Denver. The heavy wet snowfall formed a thick coating of snow on trees and shrubs…but caused little damage. North winds were sustained to 15 mph. In 1984…around a half foot of new snow fell across metro Denver…causing flight delays at Stapleton International Airport where snowfall totaled 6.0 inches and north winds gusted to 31 mph. Up to a foot of snow fell in the foothills. Icy roads produced numerous traffic accidents. In 2011…strong bora winds developed along the Front Range following the passage of a storm system. Peak wind gusts included: 87 mph at the National Wind Technology Center; 82 mph…6 miles northwest of Boulder; 72 mph at Front Range airport in Broomfield; 71 mph at Longmont; and 64 mph…4 miles west of Lakewood. At Denver International Airport…a peak wind gust of 48 mph from the west was observed on the 22nd. In 2013…A wet early spring snowstorm brought heavy snow to parts of the Front Range Foothills and Urban Corridor. The heaviest snowfall occurred near the Front Range Foothills and Palmer Divide. Near blizzard conditions forced the closure of Interstate 70 east of Denver. In the foothills… storm totals included: 14.5 inches near Conifer; 14 inches just southwest of Eldorado Springs and Intercanyon; 13 inches near Indian Hills; 12.5 inches near Pinecliffe; 11.5 inches near Golden; 11 inches near Jamestown and Roxborough; 10.5 inches near Brookvale and 10 inches at Genesee. Across the Urban Corridor and Palmer Divide… storm totals included: 12.5 inches…8 miles southeast of Watkins; 10.5 inches in Boulder…Centennial and Northglenn; 9.5 inches…just south of Aurora; 9 inches in Westminster; 8 inches at Lafayette; 7.5 inches near Morrison; 7 inches in Arvada…Bennett…Brighton; 6 inches in Highlands Ranch… Longmont…Louisville and Thornton. Officially…11.6 inches of snow fell at DIA from the evening of the 22nd to the afternoon of the 23rd…which set a new two-day snowfall record in Denver for the date. In addition…a peak wind gust to 33 mph was observed from the east on the 22nd with a gust to 30 mph from the north on the 23rd. In 2016…a powerful blizzard developed across the Front Range of Colorado late on the 22nd and continued through much of the 23rd. The storm tracked east-southeast across Utah on the 22nd…and then into southeast Colorado by the morning of the 23rd. The storm rapidly intensified as it reached eastern Colorado…producing extremely heavy and intense snowfall with snowfall rates exceeding 3 inches per hour at times. In addition to heavy snow…strong winds gusting in excess of 50 mph east of I-25 produced widespread blizzard conditions and zero visibilities. The storm initially began with rain on the plains…but quickly changed over to snow during the early morning hours of the 23rd. Snowfall rates of 1 to 2 inches per hour were common…with several inches of snow already accumulating for the morning commute. Many roads became impassable due to the depth of fallen snow…drifting snow…and near zero visibilities during the day. During the peak of the storm… snowfall rates reached or exceeded 3 inches per hour. Widespread road closures occurred…including I-76 from northeast of Denver to the Nebraska state line…I-70 east of Denver to the Kansas state line…and much of I-25… from near Castle Rock to Colorado Springs. The Colorado Department of Transportation estimated over two thousand vehicles became trapped on I-25 near Monument Hill alone… with hundreds of stuck or abandoned cars elsewhere. Numerous power outages occurred as heavy wet snow accumulated on trees…despite the strong winds. At the peak…several hundred thousand residents along the Front Range were without power. Denver International Airport was closed for 7 hours during and just after the peak of the blizzard…with around 1300 cancelled flights. The power outages shut down the fuel farm pumps…the deicing facility…as well as train service to the concourses at the airport. Pea Boulevard…the main road to the airport…was impassable for much of the day. It was the first time since December 21…2006 that Denver International Airport had been shut down due to extreme winter weather conditions. One to 2 feet of snow fell across much of the Front Range Foothills and Urban Corridor. In the foothills of northern Jefferson County…31.5 inches of snowfall measured at Pinecliffe. Most of the snow fell within a 12-hr period from the early morning into the afternoon. A peak wind gust of 59 mph recorded at Denver International Airport. South of Denver…over the Palmer Ridge…12 to 18 inches of snow was reported…with 6 to 10 inches across the adjacent plains. The official snowfall measurement at Denver International Airport was 13.1 inches. In addition…the snow was very heavy and wet…with many areas receiving 1 to 2 inches precipitation. In the foothills…some locations received nearly 3 inches of water from this storm. In 1887…west winds sustained to 44 mph warmed the temperature to a high of 66 degrees. In 1910…southwest winds were sustained to 40 mph. The Chinook winds warmed the temperature to a high of 73 degrees. In 1913…west winds were sustained to 40 mph with a gust to 44 mph. In 1951…a Chinook wind gust to 56 mph was recorded at Stapleton International Airport. In 1957…strong north winds gusting to 62 mph reduced the visibility at times to 1 mile in blowing dust at Stapleton Airport as metro Denver dodged a major spring storm… Which produced heavy rain…snow…wind…and dust over eastern Colorado on the 22nd through the 25th. Snow drifted to 15-foot depths in some areas. All traffic was blocked…power lines were downed…and livestock and crop losses were high. In 1994…strong winds raked the eastern foothills. While the highest winds occurred north of metro Denver…wind gusts to 74 mph were recorded atop Squaw Mountain near Idaho Springs and to 70 mph at Rocky Flats north of Golden. West wind gusts to 40 mph were recorded at Stapleton International Airport. In 2005…lightning struck the roof of a home in paradise hills near Genesee. About 5 percent of the residence was damaged by the resulting fire. This entry was posted on Thursday, March 21st, 2019 at 2:58am MDT and is filed under Weather History. You can follow any responses to this entry through the RSS 2.0 feed. You can skip to the end and leave a response. Pinging is currently not allowed.